Sri Lanka Ports Authority (SLPA) won the Ports Authority of the Year 2019 Award by the Global Ports Forum (GPF) for the second consecutive year at the GPF awards ceremony 2019 followed by the conference forum held at the Hyatt Regency Dubai Deira, in the United Arab Emirates on 20th February 2019. 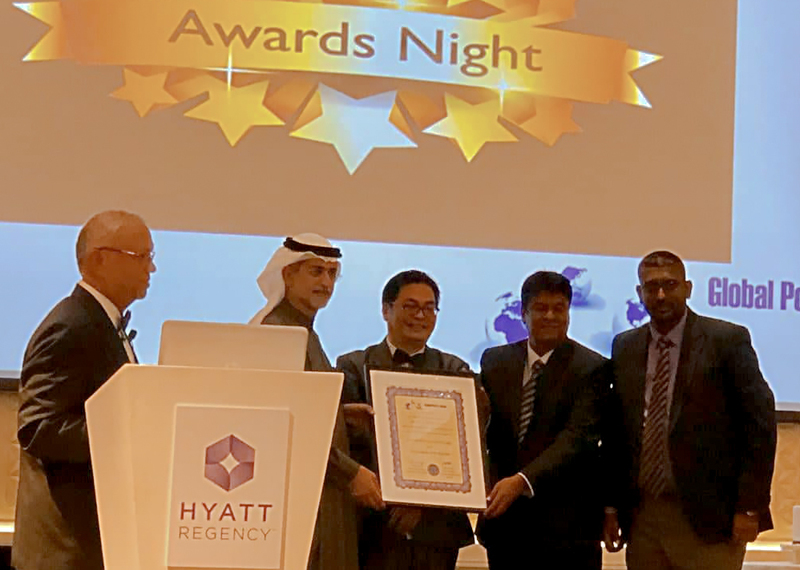 Mr.Upul Jayatissa – Director (Logistics, Marketing & Business Development) and Mr.Nalin Aponso – Chief Manager (Communication and Public Relations) received the award on behalf of the Sri Lanka Ports Authority (SLPA) from H. E. Mr. Mohammed Sharaf, Assistant Foreign Minister for Economics and Trade of UAE & former Group CEO, Dubai Ports World who attended the Guest of Honour at the event. The Global Port Forum Awards 2019 aims to recognize the most valuable contribution made by organizations and professionals in different areas of Ports and Terminals Industry and acknowledge their roles and achievements in different categories. These Awards are awarded based on the nominations received and also in recognition of the important contributions and achievements made by organizations and professionals across the industry of ports and maritime in the last year. The prestigious panel of judges, comprising of Global Ports Customers and Senior Port Experts from the Global Ports Council had duly shortlisted and selected Sri Lanka Ports Authority (SLPA) as the most deserving winner for the category of The GPF Award for “The GPF Award for “Port Authority of The Year 2019”. In a special message Hon. Minister of Ports, Shipping and Southern Development Sagala Ratnayaka congratulated and conveyed warn regards and wishes for Sri Lanka Ports Authority (SLPA) on the achievement. From the cosmopolitan global port city of Singapore, the entrepreneurial decision was taken in 2008 to found and launch the Global Ports Forum (GPF). The awards ceremony is organized annually by the GPF, in continuation of the commitment of improving global ports and furthering the interests of ports globally through collaborations among members of the port eco system. The Global Port Forum Awards 2019 aimed to recognize the most valuable contribution made by organizations and professionals in different areas of Ports and Terminals Industry and acknowledge their roles and achievements in different categories. The awards are awarded based on the nominations received by the Global Ports Forum (GPF) and also in recognition of the important contributions and achievements made by organizations and professionals across the industry during the previous year. The Port of Colombo is ranked as world’s No.01 container growth port among the top 30 container ports for the year of 2018. In container handling, Port of Colombo has recorded a 13.5% growth for the 2018 over the same period last year reaching 22nd from the position of 23rd amongst global container ports, according to Alphaliner Monthly. It is also a significant achievement as it is the first time in history the Port of Colombo reaches the top of a global maritime ranking. With this growth, Port of Colombo has leapt ahead many other Asian Ports, Major European Ports and Dubai as well. The Drewry Port Connectivity Index ranked the Port of Colombo at the 13th best Connectivity Port in the world in 2017. According to the rankings the Port of Colombo also became the top best connectivity port in South Asia. The relationship between the Management and SLPA trade unions, collaborative support by all parties and stake holders engaged in the port operations process has effectively contributed for the increase of productivity at Sri Lanka Ports Authority (SLPA). Creating history, the Port of Colombo for the first time has recorded 7 million container operations in the last year with joint marketing strategies by the three terminals, the JCT, SAGT and CICT. The three terminal operators at the Port of Colombo; the Jaya Container Terminal (JCT) under SLPA, the South Asia Gateway Terminals (SAGT) and the Colombo International Container Terminals (CICT) early this year, reached into a Memorandum of Understanding (MOU) to operate collectively to promote the Port of Colombo. Under the new collective agreement, it was expected to minimize the waiting time of all container vessels outside the port waters by allowing operations of vessels at the immediately available terminal. Further, through this agreement, terminals are also able to promote the Port of Colombo collectively and collaboratively in the arena of international maritime business. The Port of Colombo marked the operation of its first TEU in the year of 1973. Accordingly, the constructions of Sri Lanka Ports Authority (SLPA) controlled Jaya Container Terminal’s stage – I was completed in 1985. The completion of the stage – II of the JCT in 1987, stages – III and IV in 1995 and 1996 respectively marked the increase of operation volumes of the Port of Colombo. Commencement of the South Asia Gateway Terminal (SAGT) at the Port of Colombo took place in 1999. And the Colombo International Container Terminal (CICT) was built in 2012. Sri Lanka Ports Authority (SLPA) was awarded the Ports Authority of the Year Award first in 2018 by the Global Ports Forum (GPF). SLPA at present, has prepared a Three Year Development Plan to expedite the port sector development process in the country to further increase container volumes. These developments are aimed at making Sri Lanka the Maritime Centre in Asia.